The Sofia S. pneumoniae Fluorescent Immunoassay (FIA) uses advanced immunofluorescence-based lateral-flow technology to detect Streptococcus pneumonia cell wall polysaccharide (CWPS) antigen in human urine of patients with pneumonia and in cerebral spinal fluid (CSF) specimens of patients with meningitis. CWPS antigens, if present, bind to the detection particles. When the sample migrates up the Test Strip to the Test Line, the antigen-conjugate complex is bound to the capture antibody, forming a fluorescent line. If antigens are not present, the fluorescent microparticles will not be trapped by the capture antibodies nor detected by Sofia. Sofia will scan the test strip and measure the immunofluorescent signal by processing the results using method-specific algorithms and display the test results (Positive, Negative, or Invalid) on its display screen. The test results can also be automatically printed on an integrated printer if this option is selected. An internal control line helps ensure that the rapid S. pneumoniae test has been executed properly, that the kit reagents are performing appropriately, and that adequate flow has occurred through the test strip. Another fluorescent line should form at the Control position on the test strip each time a specimen or control is tested. If no control line is detected, the test will be reported as invalid by Sofia. 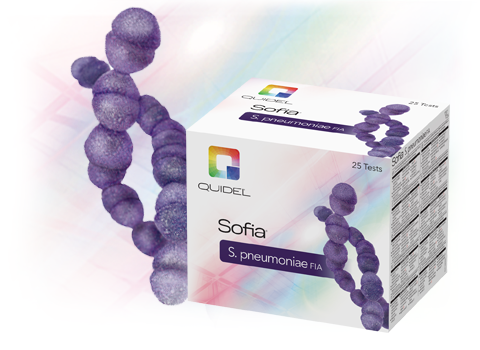 The enhanced sensitivity of the Sofia S. pneumoniae FIA gives you accuracy and confidence in rapid testing. The Sofia S. pneumoniae FIA is one in a growing menu of the fluorescent antibody tests available for use on Sofia. This easy-to-use qualitative fluorescent test can be used as an aid in the rapid diagnosis of S. pneumoniae infection. No refrigerator space needed. No need to wait for reagents to warm up. Rapid S. pneumoniae tests can be run immediately as needed.